While many people grew up eating white rice, those with nutrition junkies in the household frequently ate presoaked brown rice. For the tastiest and healthiest results, the hearty grain requires knowledge of precise preparation steps. Before including it as part of a meal, understanding the structure of the grain and how it differs from white rice is helpful. Brown and white rice start out the same. The grains undergo husking or hulling after harvest. At this point, brown rice is ready for market. White rice is the result of removing the germ and bran and polishing each grain, which depletes many of the natural nutrients and fibers. Some fortified white rices have these components added back into them before marketing. Brown rice, like white rice, comes in three grain sizes: short, medium and long. Different sizes have varying starch contents, with the heaviest concentration in the smaller grains. 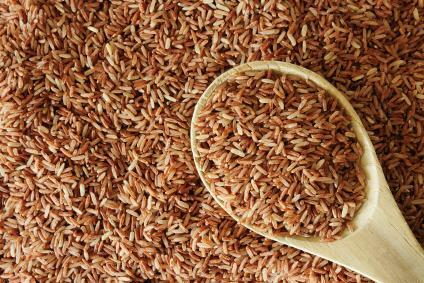 Brown rice is more perishable than white rice because of its higher protein and natural oil content. Even when stored in an airtight container, brown rice is susceptible to rancidity after a couple of months. Keeping it in the refrigerator or freezer helps it stay fresh longer. Many diners who ate brown rice decades ago were put off by its chewy or brittle texture, which is usually the result of skipping the presoaking process or undercooking the rice. For most recipes, brown rice is a good substitution for white. Allowing extra time for presoaking as part of the preparation of brown rice ensures it will be done at the same time as other dishes in the meal. There are two distinct steps involved, soaking and cooking. Together, they take about nine hours from start to finish. Not only does soaking the brown rice prior to cooking release beneficial enzymes in the grain, it also increases its digestibility. The same tip applies to other whole grains, like groats, quinoa or barley. Combine rice and water in a covered container and let the rice soak for eight hours or overnight at room temperature. Bring the preferred rice cooking liquid to a boil in a large saucepan that has a tight-fitting lid. Rinse the soaked rice in a colander or strainer, swirling it around to remove all sediment or contaminants. When the water runs clear, add the rice and salt to the saucepan. Put the lid on the pot, and place the pot over heat. Reduce the heat to medium, and let the mixture gently boil for 30 minutes. Quickly drain the rice in a strainer, and return it to the pot. Cover the pan, turn off the heat, and let the steam finish cooking the rice for about 10 minutes. Add butter, stir the rice, and transfer it to a serving bowl. If stovetop room is limited or you prefer oven cooking, bake your brown rice. Raw brown rice replaces presoaked brown rice in this recipe. Bring the liquid to a boil and add fat. Pour the liquid into an ovenproof glass or ceramic baking dish. Add the rice and stir. Tightly cover the dish with heavy-duty aluminum foil. Adjust the oven rack to the middle position, and preheat it to 375 degrees Fahrenheit. Bake the rice for about an hour. Remove the foil, and fluff the rice with a fork before serving. Although it may seem bothersome to prepare presoaked brown rice, the resulting dish is a healthy addition or main attraction for many meals. Try different types and brands of brown rice to find one that provides your favorite flavor and texture, and experiment with different cooking liquids to add different tastes to the food.